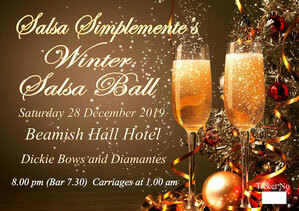 Winter Salsa Ball and other Events - Salsa Simplemente's Page. As far as dress code is concerned, salsa is pretty informal. For party nights and special occasions people do get dressed up, especially the ladies. But when it was suggested some years ago that I organise a Salsa Ball, I really doubted it would work. Wrong again! The ladies loved the opportunity to really dress up, and the guys in their DJs provided them with an elegant backdrop. Over the years I have suggested a change to the format – a salsa class, an alternative dance class, a dance demo, a band perhaps? But the resounding collective voice has been “ No! We just want to get dressed up and come and dance”. So be it. 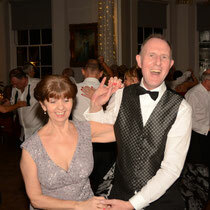 The format for the Salsa Ball is very simple – an opportunity to dump the jeans, T-shirts and trainers, to dress to impress with a theme of Dickie Bows and Diamantes - DJs and dickie bows for guys, posh-frocks for ladies. Sue (Salsa .... feel the heat). for the sixth successive year.